In late 1865, Robert Charles was born a free man in Copiah County, southwest Mississippi. It was not long after the Union Army had dealt the treasonous insurrection its final defeat on the battlefield at Appomattox. Charles’ parents would have been enslaved when they conceived him. The most concrete things that can be said about his childhood in Copiah are that his parents were sharecroppers as well as being literate and that his father was a registered voter. What was especially noteworthy about Copiah was that unlike elsewhere in Mississippi, it developed a political coalition between poor whites and African Americans under the banner of the Independent Party until 1883. That year, interracial class solidarity at the ballot box in Mississippi was defeated via assassinations and a mass riot led by the county’s white Democratic Party. This was the world in which Robert Charles grew to adulthood. Throughout his 20s Charles did what many young men from poor backgrounds did during the late 19th century—he took to the road in search of decent jobs, opportunity, and independence. By century’s end he had established himself in New Orleans, working in a variety of jobs and generally residing around Central City along with thousands of other who migrated to the city from places as close as Copiah and as far away as Sicily, China, and Ireland. He was known around the neighborhood for his intelligence, his love of reading and autodidacticism, and his promotion of the Back-to-Africa movement. Late in the night on July 23, 1900, Charles and a friend were doing what so many New Orleanians have done on a hot July evening before and since—sitting on a porch, probably having a drink, and waiting for friends to finish work. Three white police officers demanded to know what they were doing and for whatever reason, or no reason at all, one of the police officers grabbed Charles and started a scuffle. What is certain is that one officer pulled his gun, to which Charles in return pulled his own gun. Shots were fired, and Charles took a bullet in the leg before escaping into the night to his apartment. Upon returning to his apartment on Fourth Street between North Rampart (now Danneel) and South Saratoga, he grabbed his Winchester .38 rifle. When police, following the trail of blood arrived at his apartment, Charles opened fire, killing two officers before escaping into the night where he holed up in an apartment not far from the Dryades Market, by the corner of present-day MLK and Oretha Castle Haley. Thousands of white New Orleanians rioted through the streets and tore through homes looking for any sign of Charles. These men had practice terrorizing everyday New Orleanians—Black and white alike—having engaged in the similar anti-Sicilian riot only nine years before and they went about their bloodshed with the skill of professionals, burning down school houses, beating countless people, and killing at least 20 people before it was all over. Acting on a tip, on the 27th of July, the police along with a deputized militia that came to number in the thousands surrounded Charles’ hiding spot at 1208 S. Saratoga. There the police and the mob repeatedly fired on the house, with Charles expertly returning shots, killing another 5 police and militia members by the late afternoon. At that point, unhappy with the thousand-to-one odds in their favor, the police lit fire to the ground floor and smoked Charles out of the house. He was shot by a militia member before the crowd fired thousands of bullets into his dead body. 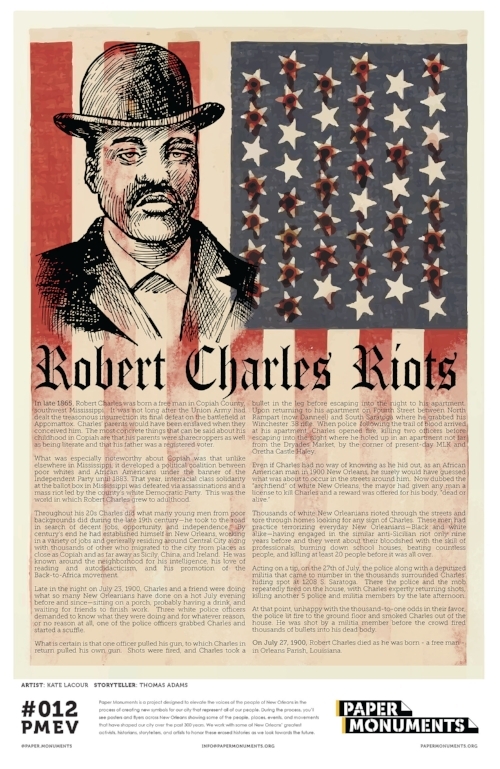 On July 27, 1900 Robert Charles died a free man in Orleans Parish, Louisiana.